2013 is a tale of two vintages in the same year. Dry and warm autumn is almost a sure thing in our region. 2013 was a rare exception. We had an unusual string of rainy days in the middle of harvest in mid September. The characteristic of the wines is as such dependent on if the grapes were picked before or after the rainy period. Wines made from grapes harvested before the rain virtually needed no sorting as they showed clean and robust flavors of a dry growing season with plenty of very hot days. The rain was a double edge sword though and a blessing in disguise if you will. On one hand it provided an opportunity for the vines to continue pushing forward for better sugar/acid balance and greater phenolic maturity but on the other hand it meant the arrival of rot (need for extensive sorting) and flavor dilution in less than ideal sites (not to worry we have no mediocre parcels). Sorting was the key word along with when the fruit was harvested and in which site it was grown. Buyers of Okanagan wines in general are best to shop by producer and well-known sites for their quick draining soil make up. Taste before you buy is our recommendation in general but in particular for 2013. Cuvée Violette, as the name suggests, displays the perfumed and floral side of this noble grape variety. in 2013 Syrah is co-fermented not with the usual addition of viognier but instead with about 1 percent of Roussanne. Roussanne acts like saffron or truffle; a small amount makes a big difference in the final result. The palate is silky smooth thanks to a gentle ferment with focus on allowing the feminine and graceful qualities of Syrah to come to the foreground. 2013 Syrah “Cuvée Violette” is meant for drinking upon release while you await your Syrah “Cuvée Classique” and Syrah “Cuvée Equinoxe” to mature. Having said that, “Cuvée Violette” can be aged for the mid term (5-8 years) and will likely continue to improve past that age too. Both meaty and savoury while also having a good dollop of ripe black fruit. Intense flavours and aromas of raspberry, blueberry, and blackberry along with complex meat, smoke, and some leather make for a very interesting and delicious wine. Nicely combines Syrah’s meaty and savoury side with some ripe black fruit and a bit of toasty oak. The raspberry, blueberry and blackberry notes are given complexity by the meat, smoke and some leather. The palate is intensely flavoured, medium in body with a nice juicy meatiness, like a freshly carved leg of lamb. Tannins are nicely structured, complexity is there and should age well. Very well done. Violette is very high quality, entry-level syrah, that in 2013 is co-fermented with one per cent roussanne. The nose is very complex with a fabulous floral nose, quite an achievement in a year where rains and rot were problems. The silky textures invite you to drink it, as does the peppery cherry fruit but the acidity comes through to freshen the finish. As suggested, you can drink this now or over the next five years. Duck and or lamb. Good value. Violet, pepper and olive nose is really appealing. Fine, expressive, meaty black fruits palate with a sweet core of fruit wrapped in bright peppery notes. Very elegant style. 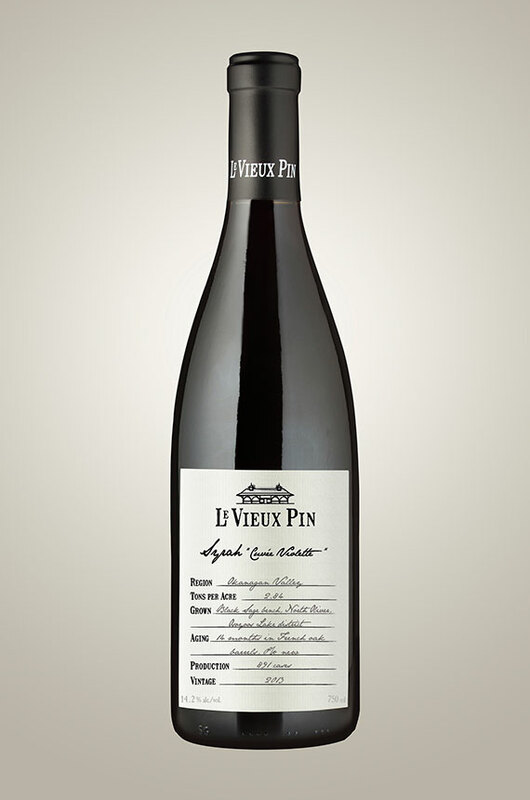 A terrific syrah here from Le Vieux Pin, fresh and delicate, fruity and, yes, violet-scented, with more than a passing resemblance to the lighter syrahs of the northern Rhône. Tannins are very fine grained and polished, though sufficient to lend support to peppered raspberry and strawberry fruit. For current enjoyment or short term hold in the cellar’ drink with a light chill to maximize the finesse. A perfumed, spicy beauty, with an amazingly long finish. The dark berries in this wine show so well and are wrapped in classic Syrah spice. This is beautiful, it’s gorgeous, and I say brilliant. What’s very interesting to the geekier among us is that the Syrah was co-fermented with Roussanne, not Viognier as is the norm. This is something you would’ve only seen back in the day in Hermitage. With less than 900 cases produced, this is a must-get-now wine. You’ll be rewarded as it’s also a ready-to-drink-now wine that’ll give you immediate gratification. The wine [co-fermented with Roussanne] begins with aromas of black cherry delicately accented with white pepper. On the palate, there are earthy flavours, including plum, black cherry and pepper. The wine aged 14 months in French oak (none of it new). The structure is firm enough to support a few years of cellaring.